Investors should carefully consider the investment objectives, risks, charges and expenses of the Princeton Long/Short Treasury Fund. This and other important information about the Fund is contained in the Prospectus, which can be obtained by contacting your financial advisor, or by calling 1.888.868.9501. The Prospectus should be read carefully before investing. Princeton Long/Short Treasury Fund is distributed by Foreside Distribution Services, L.P. member FINRA / SIPC. Princeton Fund Advisors, LLC and Foreside Distribution Services, L.P. are not affiliated. Mutual Funds involve risk including the possible loss of principal. There is a risk that issuers and counterparties will not make payments on securities and other investments held by the Fund, resulting in losses to the Fund. The value of the Fund's investments in fixed income securities, whether via direct investment or through Underlying Funds, will fluctuate with changes in interest rates. Typically, a rise in interest rates causes a decline in the value of fixed income securities. The Fund's use of futures involves risks different from, or possibly greater than, the risks associated with investing directly in securities and other traditional investments. Investments in futures involve leverage, which means a small percentage of assets invested in futures can have a disproportionately large impact on the Fund. Overall fixed income, and derivatives market risks may affect the value of the Fund. While the Fund is not designed to be correlated with the markets in general, dramatic or abrupt volatility within the market would negatively impact the Fund's strategy. Model Risk: Like all quantitative analysis, ProfitScore's directional trading model used to create the ProfitScore® Long/Short U.S. Treasuries Index carries a risk that it might be based on one or more incorrect assumptions. The model may not accurately predict the direction of the value of US Treasuries. Rapidly changing and unforeseen market dynamics could also lead to a decrease in the effectiveness of the model. 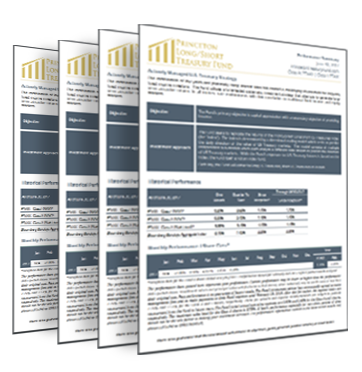 The Fund is not designed to participate in or be correlated to overall movements of the markets; therefore the Fund may not benefit from positive equity or fixed income markets, or experience the same type of positive returns as some other funds in a positive equity or fixed income market environment. As a non-diversified fund, the Fund may invest more than 5% of its total assets in the securities of one or more issuers. The Fund's performance may be more sensitive to any single economic, business, political or regulatory occurrence than the value of shares of a diversified investment company. Underlying Funds are subject to investment advisory and other expenses, which will be indirectly paid by the Fund. A higher portfolio turnover may result in higher transactional and brokerage costs associated with the turnover which may reduce the Fund's return, unless the portfolio assets traded can be bought and sold without corresponding commission costs. The Fund is a new and prior to its recent commencement of operations had no history of operations for investors to evaluate.